Tricky one, this: there's clearly no apostrophe in the gold-on-green lettering of the shopfront, though the signwriter may well have needed one for the greengrocer down the road. Where's that Lynne Truss when you need her? I've done the decent thing and added one of my own. 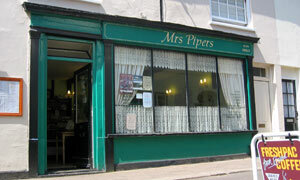 Couldn't be sure that it'd be open at the gates of dawn, hence a customary Friday lunchtime outing to Mrs Piper's. Restaurant? Tea rooms? Depends on your online directory. Look and feel of the weighty menu was reminiscent of the Whistlestop; bags of choice, from full blown meals to omelettes to toasted sarnies. There's thorough fare on the Thoroughfare, geddit. Choice made no easier by the piped Clayderman-esque muzak. Our banana milkshakes were, for us veterans of the specialist concoctions at the Black Tiles, a let-down. Place could do with a fresh lick of paint, too. Poor start. Only way from there was a Yazz-like up: tuna mayo jacket had lots of filling and an undemanding side salad, and the prawn baguette was "impressive". Other customers were tucking into the likes of a veg-free steak & kidney pie and chips. Homely setting with lace at the window and an imposing dresser of home-made jams for sale. In a word: traditional. Good range of cakes, inc. coffee & walnut, fruit, and even one topped with Mars Bar: that's as radical as it gets. While others in our party were forced to share a slice, I had around 22 degrees of luscious lemon cake to myself. Unusually, this high street tea shoppe not only has one of those proper coffee machines but knows how to use it. The macchiato was spot on. If it was a car -- Rover 75. If they were passing by -- Pam Ferris.